Before the 1996 Maoist insurgency, there were 84 rhinos in Babai Valley of Bardiya. After a decade of the bloody insurgency finally came to an end, a rhino census of 2006 showed that none of the rhinos survived. CHITWAN, March 27: The government is all set to translocate five rhinos from Chitwan National Park (CNP) to Shuklaphanta National Park amid concerns from the locals regarding the safety of the endangered species in the new location. 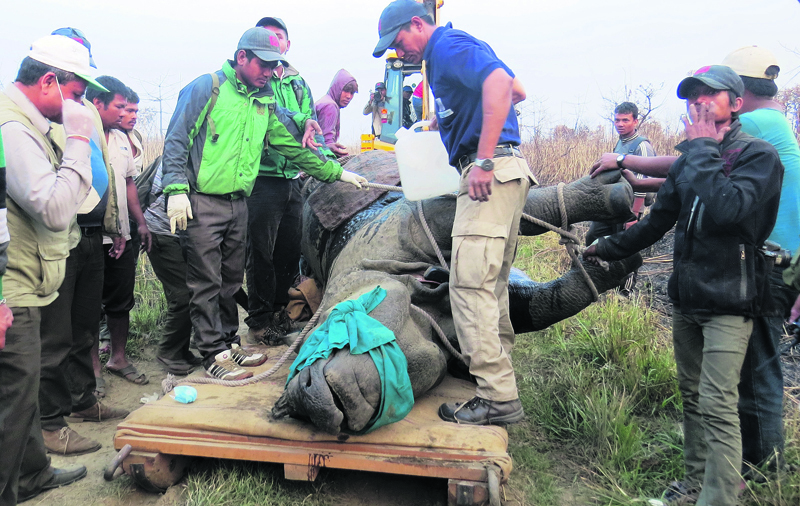 Five rhinos, including a pregnant one, were translocated from CNP to Babai Valley of Bardiya National Park last year. The pregnant rhino had given birth to a calf within a few months of being translocated. However, the calf was recently killed in a tiger attack. Not just rhinos, tigers translocated from CNP also have also been killed due to lax security. Forest officials have been facing difficulties in saving translocated rhinos from poachers and other threats. Well aware of it, locals of Chitwan have demanded assurance that the new location for the rhinos is safe. Before the 1996 Maoist insurgency, there were 84 rhinos in Babai Valley of Bardiya. After a decade of the bloody insurgency finally came to an end, a rhino census of 2006 showed that none of the rhinos survived. Even today, Bardiya, where the translocation is taking place, is not considered safe for rhinos. Due to such incidents, Chitwan locals and conservationists have been protesting against translocations since last year. Basu Dhungana, chairman of Mrigakunja Buffer Zone User Committee, said local authorities last year had formed some agreements with local communities after the rhinos were previously translocated. Along with Mrigakunja Buffer Zone User Committee, 19 organizations of Sauraha on Sunday issued a joint statement to grab attention of the authorities. They have set forth seven-point demand seeking commitment from authorities regarding safety of the rhinos in the new location. As per the latest rhino census in 2015, there are 645 rhinos in Nepal, out of which 605 are in Chitwan. Ram Chandra Kandel, chief conservation officer of CNP, informed that the translocation will start on April 3. “Our preparation to translocate four female and one male rhinos have now reached the final phase,” he said while speaking with reporters on Sunday. Rhinos from CNP have previously been translocated to Shuklaphanta and Bardiya national parks. Data show that 87 rhinos have been translocated from CNP to Bardiya and Shuklaphanta until 2003. Among them, 82 were translocated to Bardiya while five were translocated to Shuklaphanta.